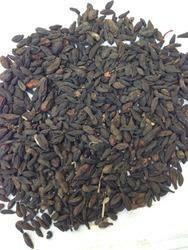 Black Himej is a herb having numerous medical applications. We Deal in Exports Inquiry Only. Myrobalans contain astringent principles: Tannin (tannic acid) 45 p. C. And a large amount of gallic acid, lacilage, a brownish yellow colouring matter. Chebulic myrobalans are used in fevers, cough, asthma, urinary diseases, piles, worms and rheumatism, and scorpion-sting. Price Rs 144/kg, Rs 18/100gm. We are offering Black Himej. This is useful in vitiated conditions of tridosha, gout, rheumatism, wounds. It is believed that it can destroy all diseases and eliminate all waste from the body, and also promote tissue growth and health. Our clients can purchase this Black Himej at reasonable price. Backed by a team of knowledgeable professionals, we are an identified firm in the market for providing an extensive range of Chhoti Harad. 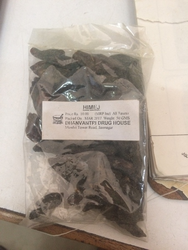 Being a well-distinguished company in the market, we are into offering Black Himej. We are provide best quality pure herbal powders of all kinds, our fine powders are pulverized in hygienic conditions suitable for medical and herbal consumption.